This is one of the 11 temples of Tirunangur Tirupati. 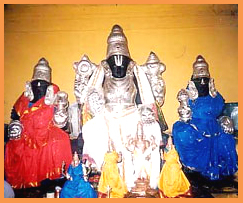 Tirumangaialwar has sung of these 11 Divya Desams. The Tirunaangur Divya Desam shrines are Kavalampaadi, Tiruvanpurushottamam, Arimeya Vinnagaram, Chemponseikoyil, Manimaadakkoyil (Narayanan), Vaikuntha Vinnagaram, Tirudevanaar Togai, Tiruttetriambalam, Manikkoodam, Tiruvellakkulam, and Parthanpalli. As per the sthalapurana, Srirama stayed with Dridanetramuni after Ravanavadha. As per the muni's advice the Lord made a cow of gold and resided in it for 4 days. The cow was later donated to a brahmin, who used the gold to construct the temple, hence the name Sempon (pure gold) sei kovil. Lord with His Consorts Sridevi, Bhoodevi and Neeladevi, Brahma and other devas graced the occassion during poornauhuti and relieved Shiva from the curse of Brahmahatya. As per Shiva's request Lord Vishnu eternally resides(Nityavasa) in all the 11 temples of Tirunangur and fulfills the devotees' desires. The Garuda seva on the day following Thai Amavasya from all the 11 temples is to fulfill the desire of Shiva. Direction and Posture Sitting posture and East-faced. Access to the temple Accessible from Tanjore Station en route Thiruvayaru. Alight at Vennarrangarai, wherefrom this is located at about 2.5 miles. Access to the temple The kshetra is accessible from Tanjore Station enroute Thiruvayaru. About 2.5 miles from Vennarrangarai. The Moolavar of this sthalam is Neelamegha Perumal. The Moolavar is giving his seva in Sitting position facing his thirumugham towards east direction. Prathyaksham for Parasara Maharishi. This temple is in Tanjore district of Tamil Nadu. It's in the banks of the river Vennaaru and its about 2 1/2 kms away from the Tanjore railway station. Bus facilities are provided and staying facilities are furnished.